Home Posts tagged "Bee friendly"
The ‘Sedums’ (also known as stonecrops or ice plants) are an easy-to-grow, low maintenance group of succulents that provide year-round interest in borders. In Spring, the first shoots form a thick clump of fleshy blue-grey leaves. 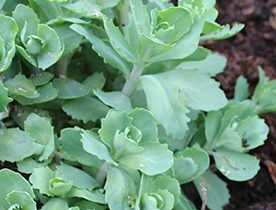 These grow into a large discrete clump through Summer, eventually producing thick erect stems, which are fairly self-supporting, up to 50 cm tall, bearing flat clusters of green buds. Sedum spectabile is at its most spectacular in Autumn, when the buds gradually open to reveal large flat clusters of tiny pink flowers that deepen to a radiant magenta as the season progresses. In Winter, the flower heads gradually turn russet-brown. 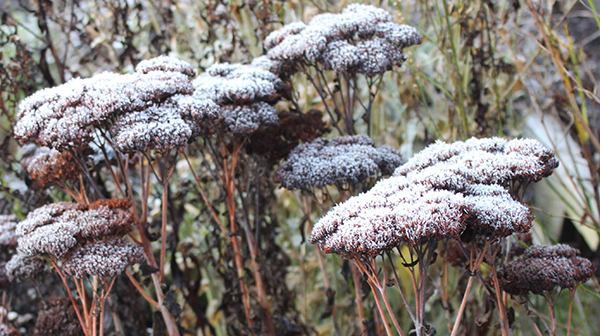 Left standing, these large stately heads add interesting structure to otherwise bare borders, provide protection for hibernating insects and look magnificent on frosty mornings, topped with a sparkling sugar coating. Simply cut down the stems at the end of winter and start the cycle all over again. Bees and butterflies love it!! 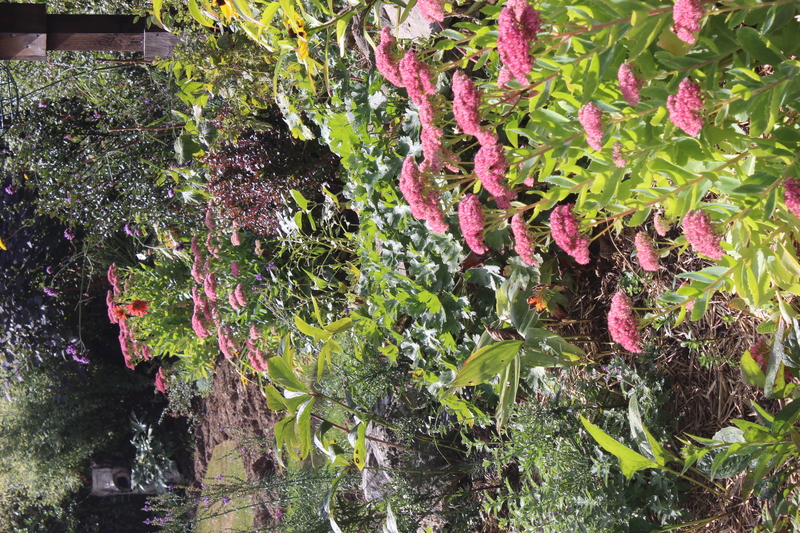 Sedums do best in light, free-draining soils, but thrive even in my heavy clay borders, although I admit I do add plenty of organic matter whenever I can to improve the soil. They like full sun, and when fully established they rarely require watering. If your stems get a bit floppy (this can happen if the soil is too rich) then cut them back by half in May. 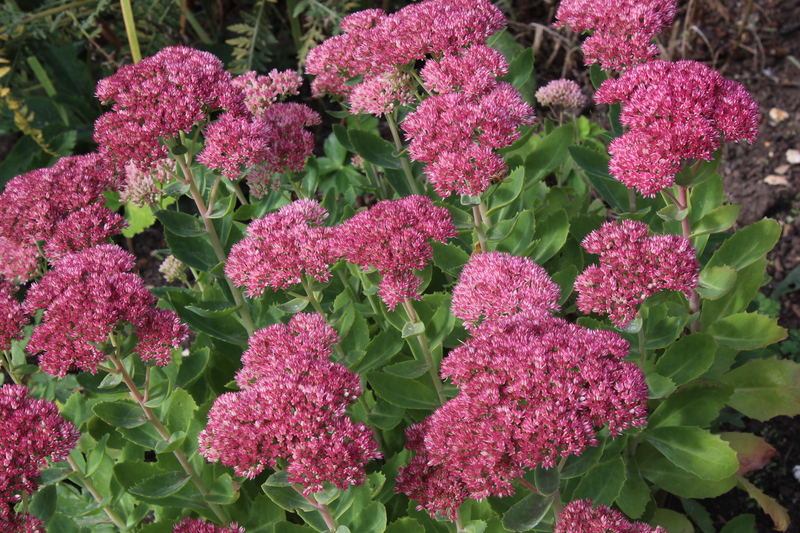 This will encourage stronger, shorter, self-supporting stems, although they will flower a little later than usual. Best of all, once you have bought one plant you will never need to buy another, as they are extremely easy to propagate. Simply cut off a short non-flowering stem, in Spring, make a hole in the ground and pop it in. Water and leave it to do its thing. 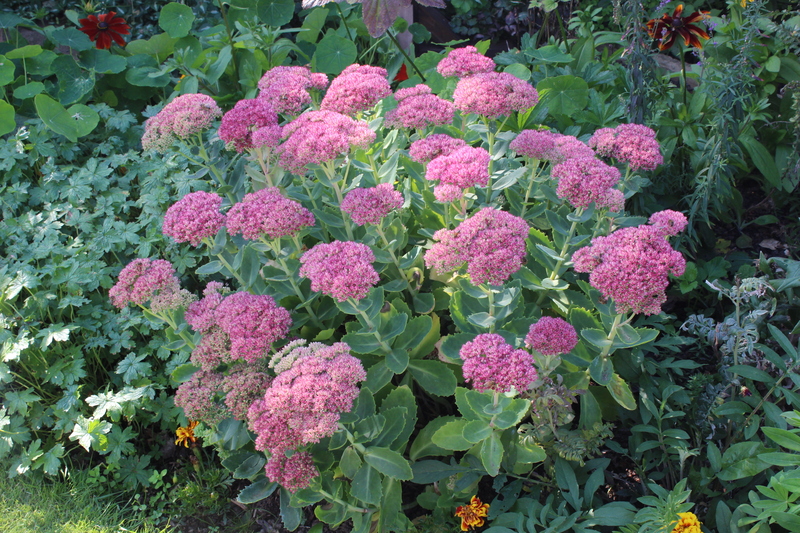 Alternatively, wait until you have a decent-sized clump and lift and divide as you would any other herbaceous perennial. I started with one plant and now have them repeating around the garden. No Matter what else I plant, they pull it all together … and never let me down. Most of all, I love how the bees and butterflies forage over them in Autumn. They are a magnet to insects at this time of year when other sources of nectar are scarce. I now have a rule for any new plants in the garden. They have to be bee friendly! So no limit on the number of Sedums. 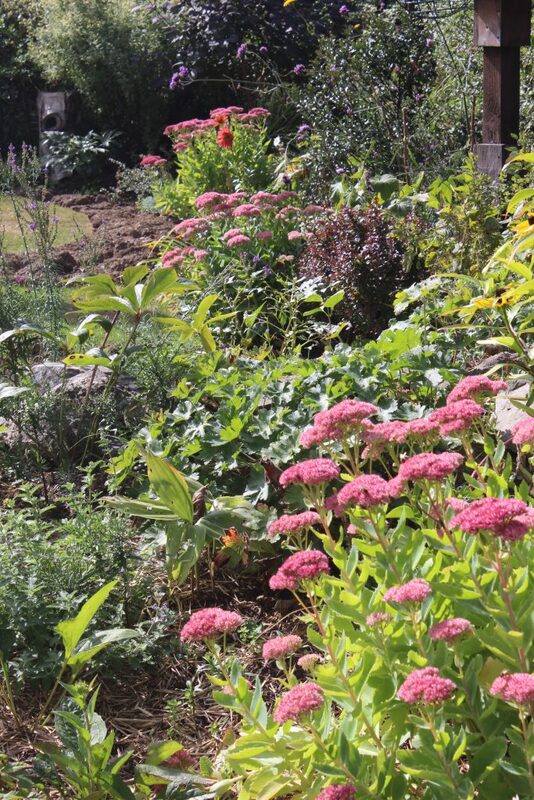 There are many different species of Sedum (Hylotelephium), with different coloured leaves and flowers, including variegated, purple-leaved and white-flowered varieties. 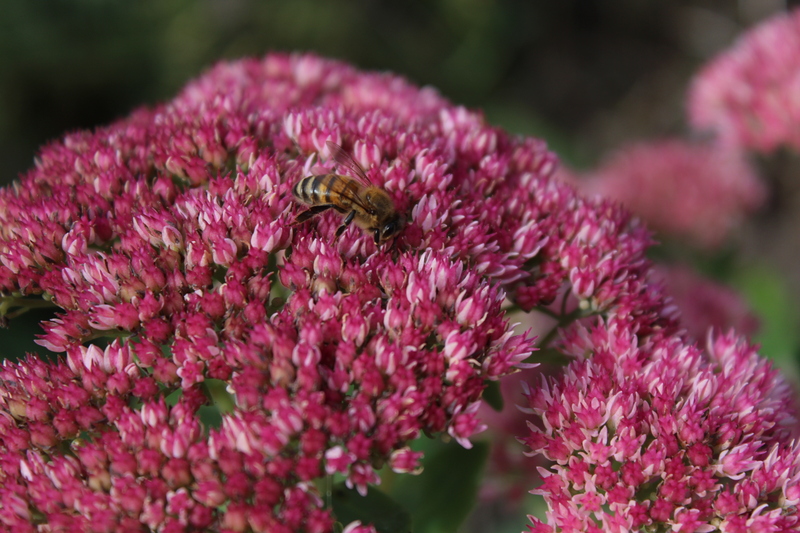 But Sedum spectabile remains my favourite.